July 4, 2018 - by Admin - 2 Comments. This is one of the most original, distinctive and out-of-the-box questions I have been asked in the recent times. Thus, this is the topic for today and this is what we are going to illuminate in the following article. 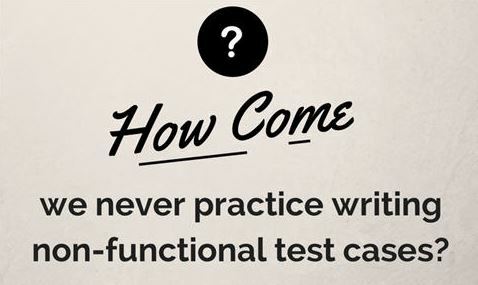 How come we never get to see and practice writing non-functional test cases? Example: The following are the steps to be performed on an Online Banking application in order to perform a transfer. Let us use that as our test of reference. Click Transfer and check if the confirmation is received, account balance has been updated and all that. On the very application, on the very transfers’ page, let us say we are performing Performance, Security and Usability Testing. These are non-functional testing types, correct? How would we write the test cases? Usability testing is a genre of software testing that deals with the user experience. These are few of the questions that we it tries to answer. If not right familiar right away, how easy is to learn? There are very many variations to performance testing, but at its core, it is used to get statistics about the system, its resource utilization, response time, network consumption etc. at various load points. Now, If I were to test the performance of the transfers’ transaction I would have 10, 20, 30, 100…1000…etc users perform transfer operation simultaneously or incrementally depending on what I want to target and gather data about. What steps would each user perform in order to use the transfers while the performance test is in progress? Security Testing is a branch of QA that helps make the software systems hack proof. It involves identifies vulnerabilities(potential problem areas in the software system), exploiting them through penetration or white hat testing technique and when loop-holes are found, they are worked on. When do I want to check if transfers are hack proof and are directed correctly to the intended recipients and that there are no black spots in the entire process? I would perform the transfer while the monitoring for security leaks goes on in parallel. Therefore, in effect, I am carrying out the exact same steps I would normally do in case of a functional test case. I guess we have enough to establish that the steps in all the situations are the same. The method and the intention behind the process are what different. Coming back to our question, why do we never learn to write non-functional test cases with every detailed step there is to it? It’s because, at their very core, test steps for variations on test types on a certain function are all the same, functional or not. It is the intention that makes a difference and maybe the method. We hope that this process of delving deep into this topic has been as much fun to you as it has been presenting it to you all. We would love to hear your feedback and thoughts on this subject. Previous Article How is Cross Browser Testing Performed?